“Baby Driver” may just be the best musical parading as an action movie I’ve ever seen. Yes, you heard me: I said musical. This is not how the movie is being sold nor do I believe many people will see it as one. They may even deride me for describing the film this way, going so far as to claim that making such a suggestion to be a preposterous proposal. Yet there I was, watching a movie with beautiful chorography and stylish music, all blending together and working off one another to form a perfectly compatable visual and aurel experience. There is even a scene where our title character turns on his iPod, and strolls down to the local Starbucks, dancing in perfect rhythm to the melody while the lyrics are placed all over the streets to let the audience know how to sing along. Yes, there are scenes of violence, car driving, and shooting to be had, but most is matched in perfect synchronization to the music that plays in on the (now outdated) device known as an MP3 player. 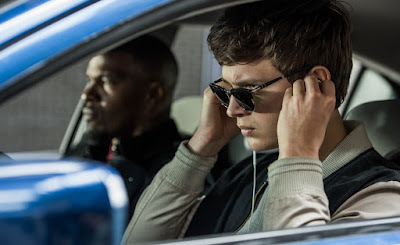 The music is listened to by Baby (Ansel Elgort), who is the designated get away driver for ruthless criminals. He is not a crook nor does he aspire to live a life of common thievery, but he has mad skills behind the wheel (so long as the right tune is playing in the background). He does this work because he owes a debt to local kingpin Doc (Kevin Spacey), who caught the kid stealing from him red handed, but was so in awe of his skills as a driver he let him go and decided to have a chat with him later. Doc is one of those criminals who, if you did have to get mixed up in illegal affairs, you’d hope to be dealing with him. He does make a threatening gesture once in a blue moon, but he will take care of you so long as you don’t screw with his business. The crew members he uses switch out on a nightly basis as he doesn’t believe in trust; Baby is the only consistent member doing jobs. As with most musicals, the life that someone lives can be shattered if the right girl comes along, and in this case that girl is Debora (Lily James). She works at the local diner Baby frequents and for both it’s love at first sight. She asks for his order, he looks up into her eyes, and before you know it Lionel Ritchie is there to sing about how wonderful life is. See what I mean? All of this follows the flow and beats of what makes a great musical, and there is more than enough music in here to justifiably call it one. 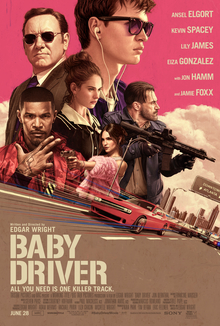 The movie was written and directed by Edgar Wright, a film maker who is known for having clever camera movement and snappy dialog in his screenplays. Reportingly, he left a lucrative job at Marvel, where he was slated to direct “Ant-Man,” to direct this instead. While I would have loved to see what his version of that movie would have looked like, it appears an excellent choice was made. For “Baby Driver” is one of those rare movies that is difficult to explain yet easy to get into. It has the kind of excitement that makes people love going to the movies, feels like something an action crowd would love to see, only to surprise us with a comical flair that can’t be contained. It is a full package of originality and fun. The kind of movie you only see once in a blue moon. It even makes me look at “The Fate of the Furious” to see that maybe, just maybe, our standards are a little low these days. Fun as that movie is, this one is brilliant and has great Donny Osmond flair. Cars will be driven and they will go fast. This will always happen in movies. But considering how many people say there is a soundtrack to your life, it is amazing that the thinking isn’t applied to more movies about fast cars and women. 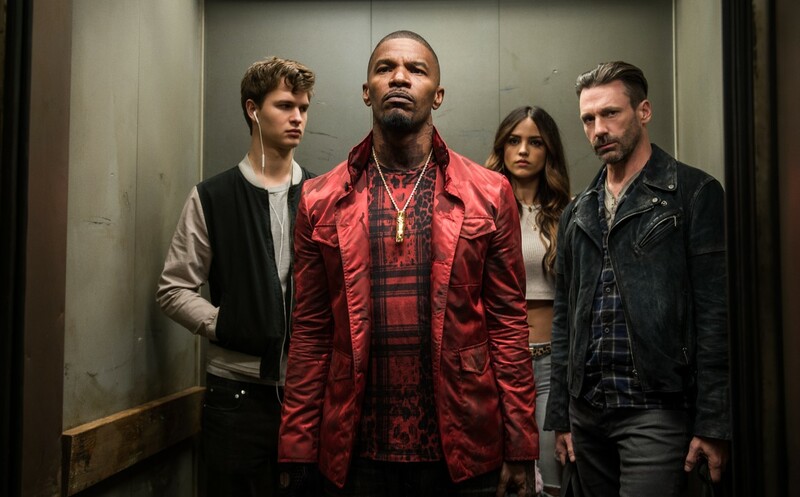 For in the case of “Baby Driver,” the soundtrack is his life, and his life becomes our joy to experience. Parents, there is some strong language, lots of violence, and some bloody deaths. Some sexual comments are also made by less classy gentlemen. Recommended for ages 17 and up.